I got a little crafty during the snow day we had earlier this week, and am so thrilled with the results that I put together a few tutorials so that you can create your own wintery works of art! Here’s a shot of the final product – if you want to know how I did it, watch the quick, 45-second tutorial video above and read on below for more detailed instructions. Leaves of your choice. 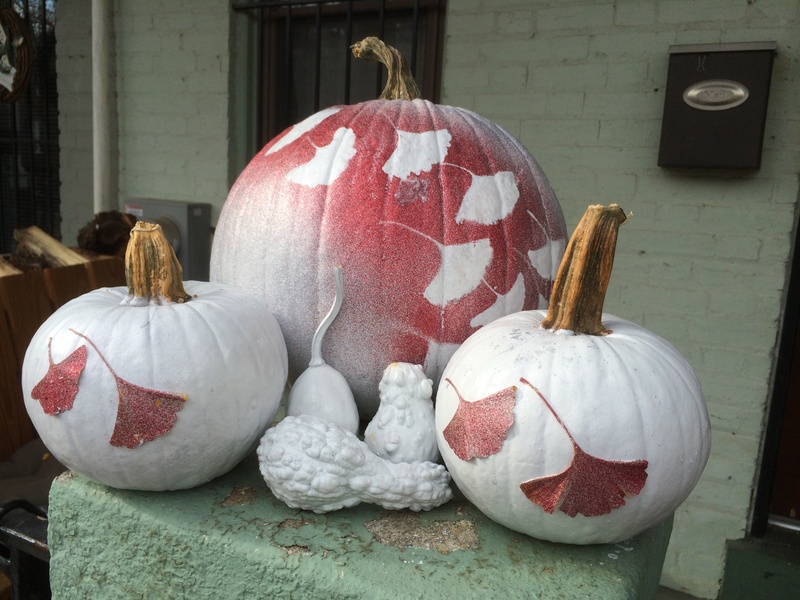 (I used gingko leaves from the trees that line my block.) Use as few or as many different types as you’d like, just make sure they’re not too dry/brittle or they won’t stand up to the process. 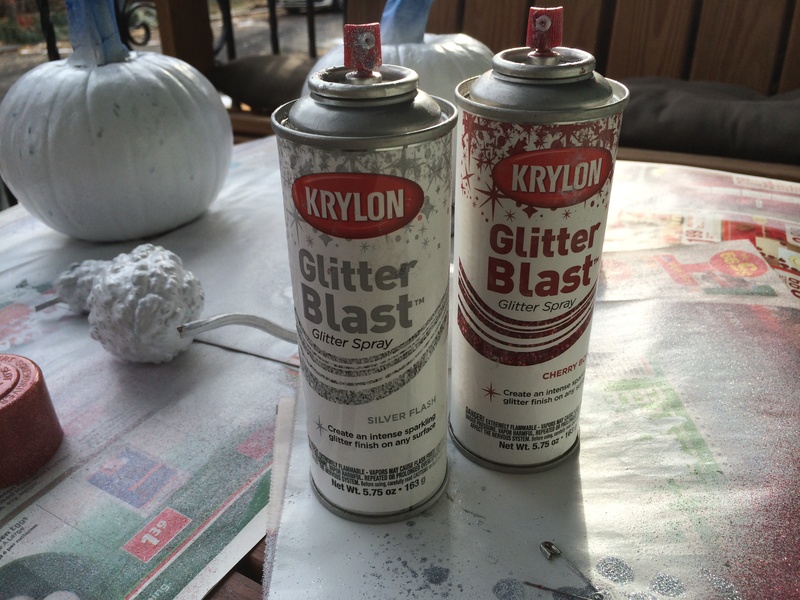 Glitter Spray Paint* in colors of your choice. I recommend choosing one metallic (gold, silver, copper, etc.) and one in a vivid, contrasting color (red, blue, green). If you just use metallics, the effects of the stenciling will likely be too subtle to see. *Please note: I do NOT recommend the Krylon brand paint pictured here and featured in my video. I had some serious technical difficulties with the stuff, and based on the reviews I read online after purchasing it from my hardware store, the problems I had are fairly common with this brand. 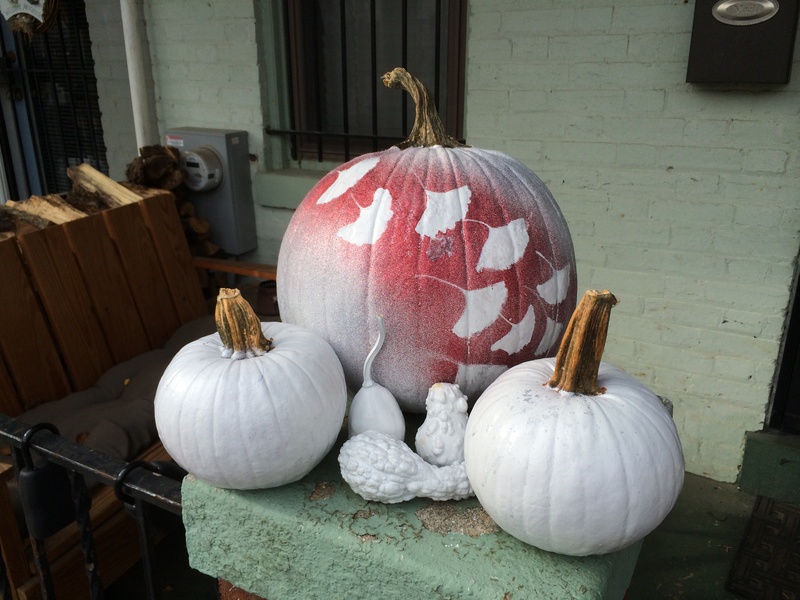 I was able to get them to work long enough to complete the big pumpkin, but wasn’t able to use them on any of the smaller pumpkins and gourds as I’d originally planned. Boo. 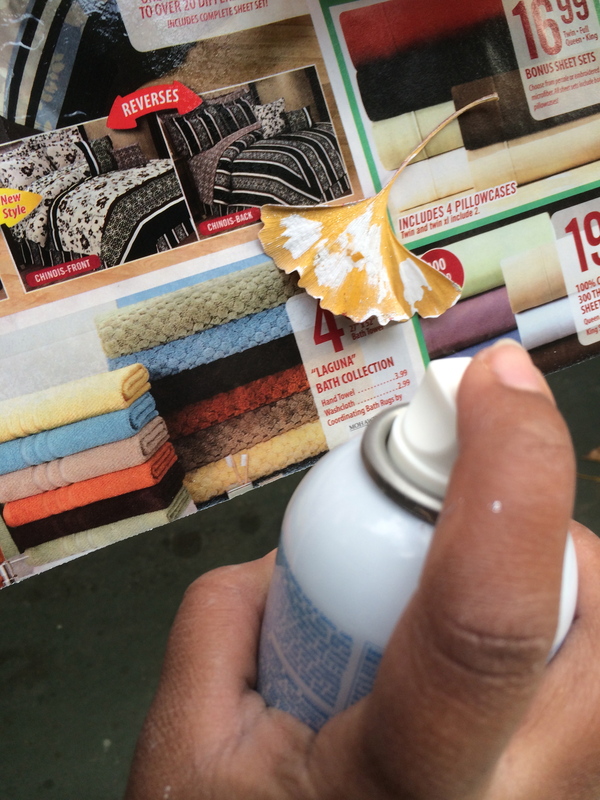 Spray adhesive/glue – I used Elmer’s in a can and it worked great. 1. Spread newspapers or tarp all over your workspace, and then some. (Spray paint travels far, fast.) 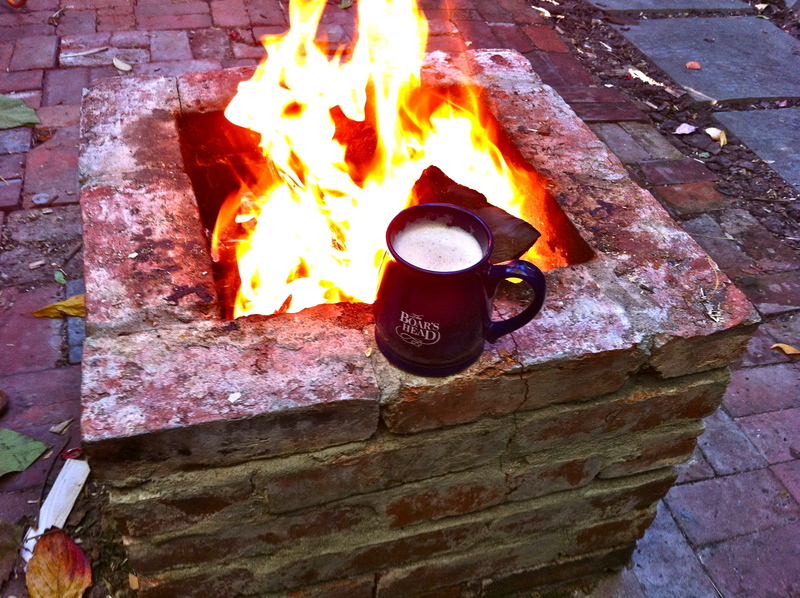 I highly recommend working outside given the high level of fumes from the spray paints and glue. 2. 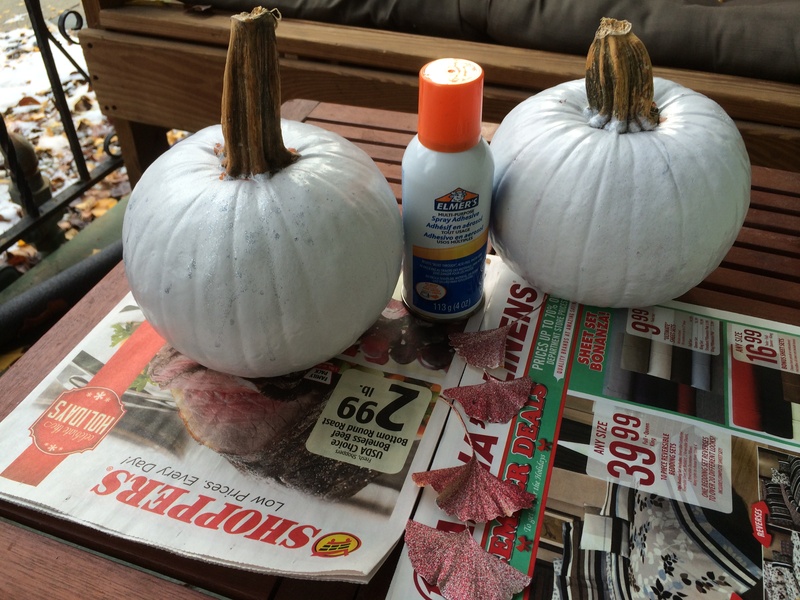 Use painter’s tape to thoroughly cover the pumpkin stems. 3. 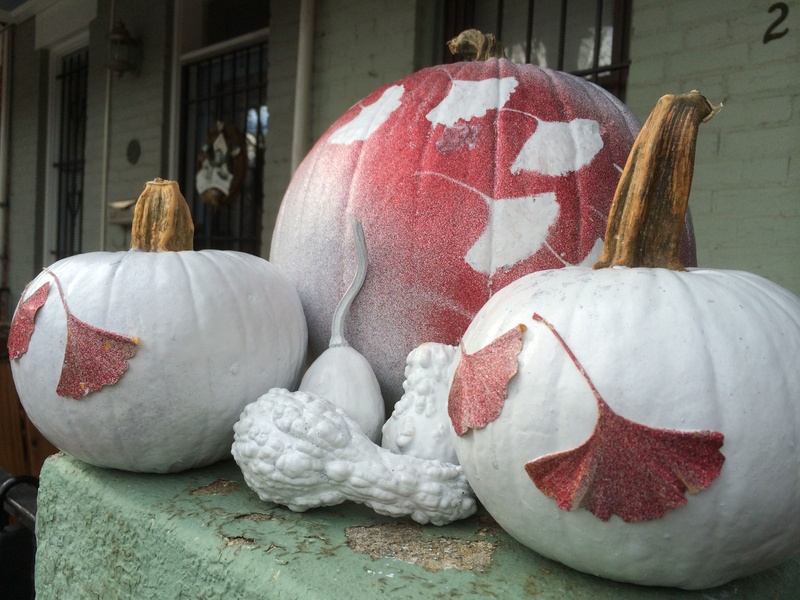 Go nuts with your white spray paint. 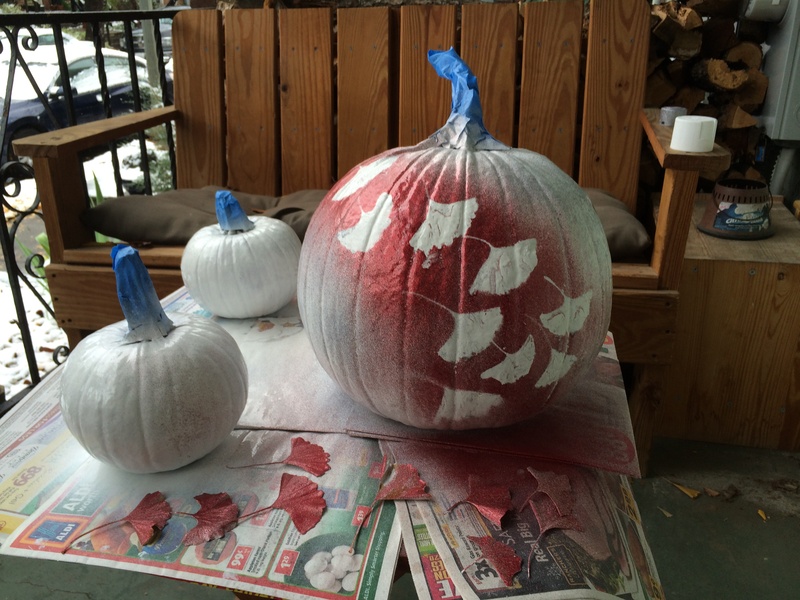 Hold the can 10-12 inches away from the pumpkin surface to prevent pooling and paint dribbles. 4. Wait about 5 minutes, then spray on a second coat to cover any thin areas or stubborn spots that are showing through. 2 coats should do the trick, but if you feel you need more, go for it. 2. 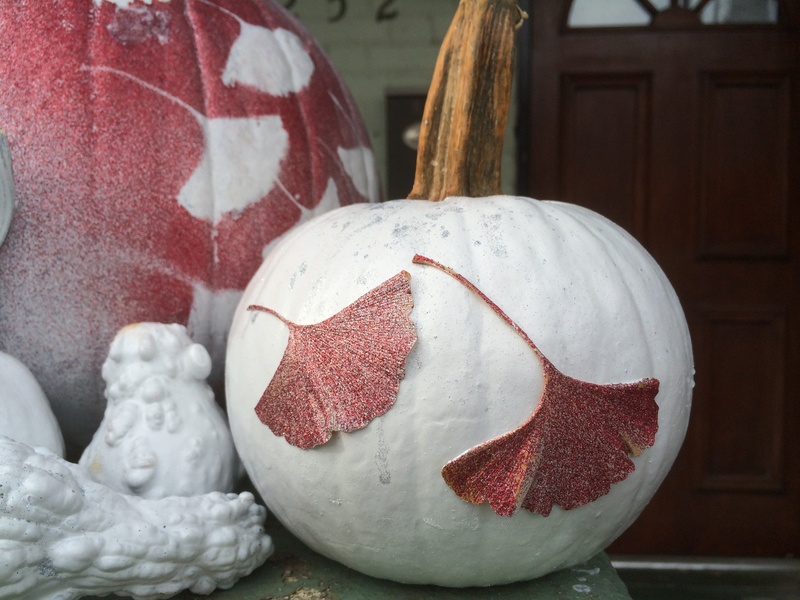 Grab your glitter spray paint – the bright, contrasting-colored one – and spray it over and around the leaves with a smooth, downward sweeping motion. (If you go back and forth with the spray or make it too choppy and burst-y, the leaves may detach from the pressure of the spray.) I chose a diagonally sweeping design. Whatever you choose, make sure the area that you’ve sprayed with the bright glitter goes at least a little ways past the edges of the leaves. 3. 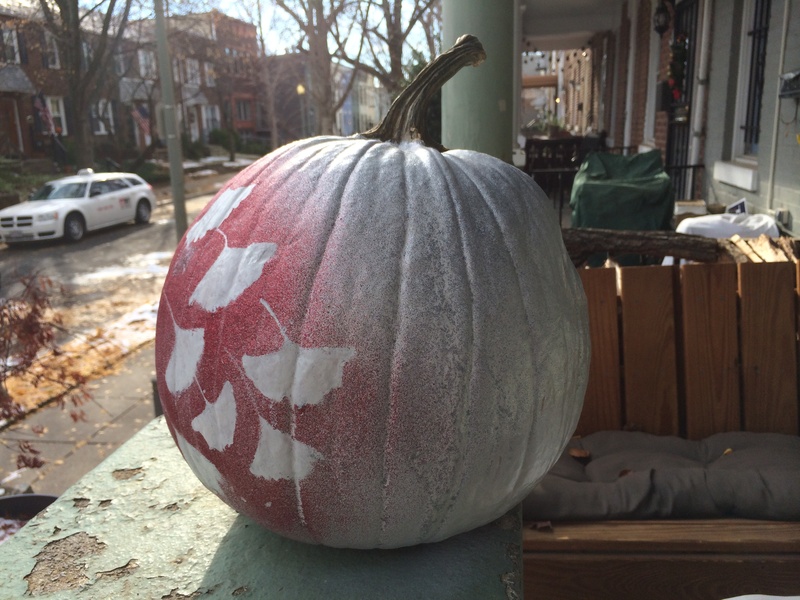 Grasp the leaf stems and carefully peel the leaves away from the pumpkins. 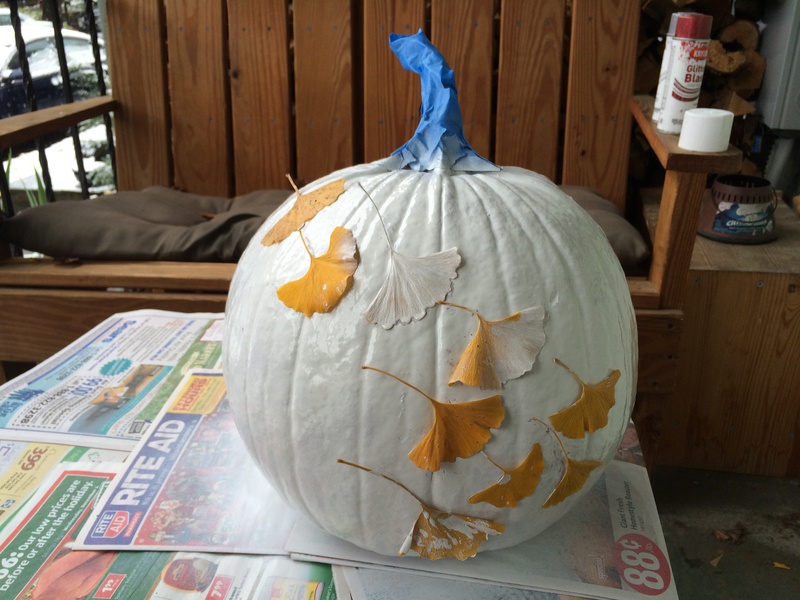 If the white paint underneath the leaves gets mussed when you pull away the leaves, just use the small paintbrush to carefully touch-up those areas. 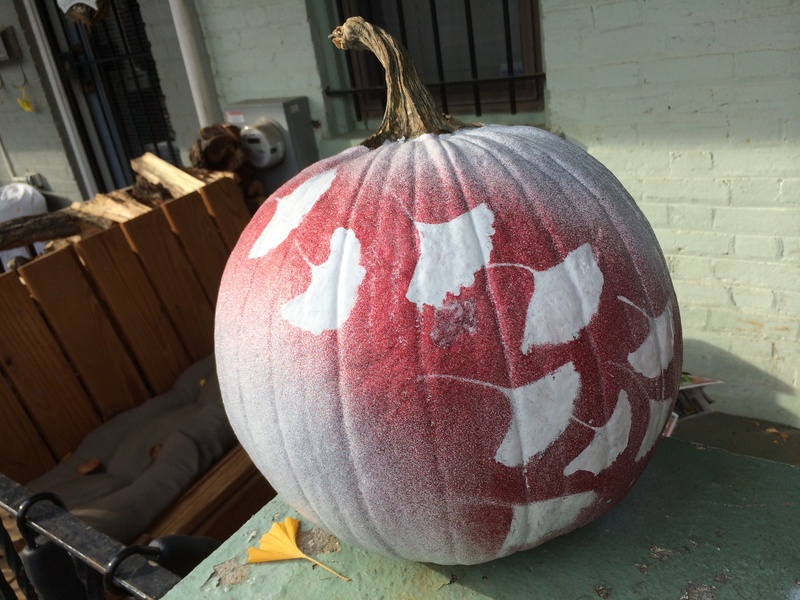 One happy result of making the stencil-style pumpkin above is that you are now left with a bunch of leaves that are covered in glitter. Waste not want not! 1. 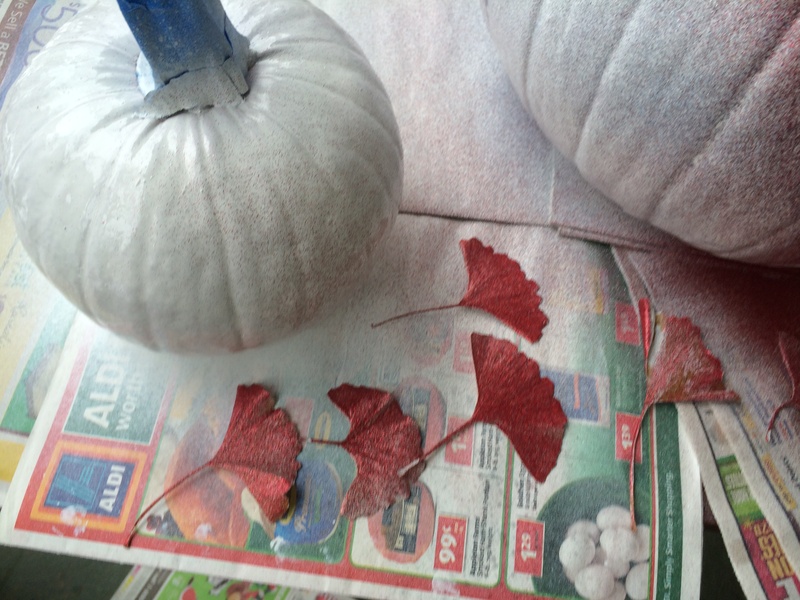 Spray the unpainted sides of the leaves with your spray adhesive/glue. Be generous, especially around the thin stem areas.